Of course, I had to play with it ASAP … so I started this card completely backwards with no idea of what I wanted to do. I just wanted to see how the pop-up was created. I cut the die from white card stock and attached it to a white card base, just to see how it fit together and how easy it was to construct. It was so cute I decided to go ahead and create a winter scene. I stamped and fussy cut trees using some old Hero Arts stamps and stuck them on. Of course, it was still too plain so I added some silver snowflakes (also from Hero Arts). And then the greeting. Totally unplanned; I just kept building the card. I felt kinda dumb, because now I had a plain white front that would be difficult to stamp on. But then … ta da! 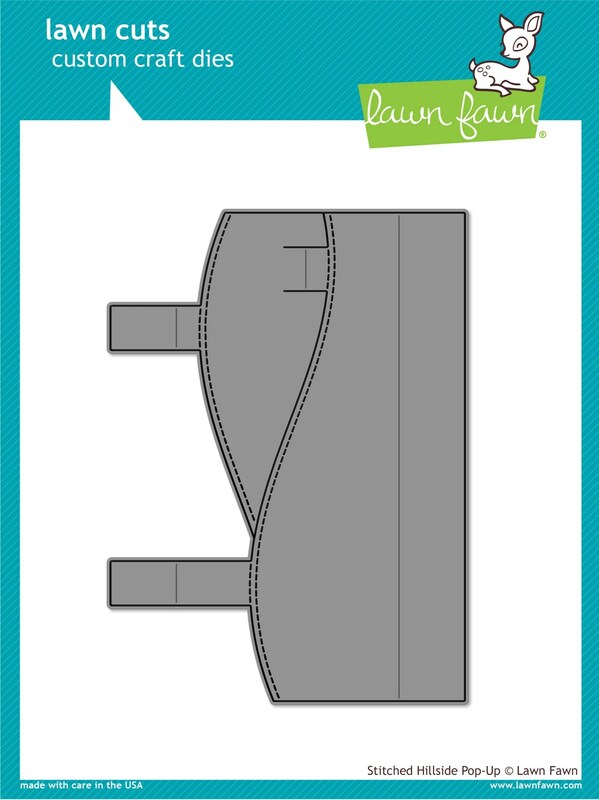 … I watched this great Lawn Fawn tutorial and I loved the way Kelly Marie created a belly band for the front of her card! So simple! And now I’m hooked! It’s not the greatest card, but it was fun and surprisingly easy — a good learning experiment!